COMMENT | The Malaysian Bar is deeply troubled by the introduction of the Anti-Fake News Bill 2018 in Parliament yesterday. It is the stated intention of the government to have this legislation passed in the current sitting of Parliament, and it will likely be brought into force before the campaign period for the 14th general election. What is ‘false’ is not defined. “False news” is already criminalised under section 8A of the Printing Presses and Publications Act 1984 (PPPA). The definition of “publication” in the PPPA is not dissimilar to the various definitions in the proposed legislation. A “false” communication is also criminalised under section 233(1)(a) of the Communications and Multimedia Act 1998 (CMA). 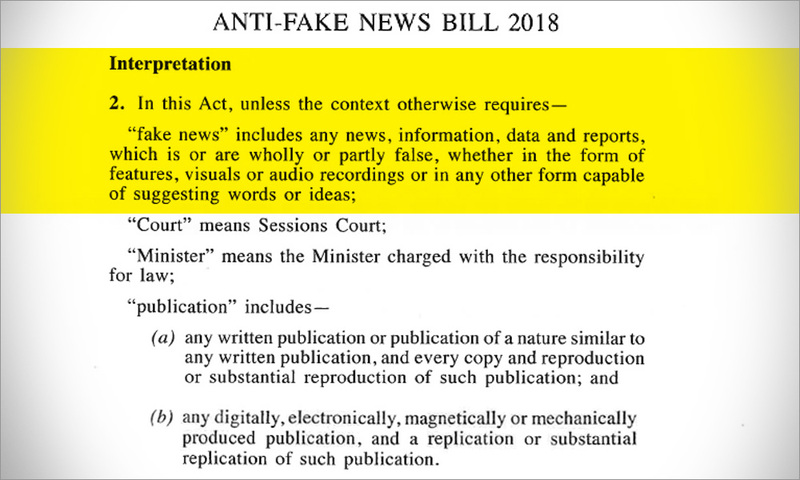 These provisions beg the question of why there is any need to create a new law to criminalise “fake” or “false” news. The proposed law criminalises “fake news,” but since that is not clearly defined, it could be used to suppress freedom of expression in the context of expressing views or opinions. The wording of the provisions is sufficiently wide for an action to be brought challenging “correct” or “incorrect” views on, for example, the economy, history, politics, science, and religion. Such a law may be far too wide, and could be held to be ultra vires of the Federal Constitution. Therefore, neither the complainant nor the person complained of needs to be physically present in Malaysia for the offence to have been committed. 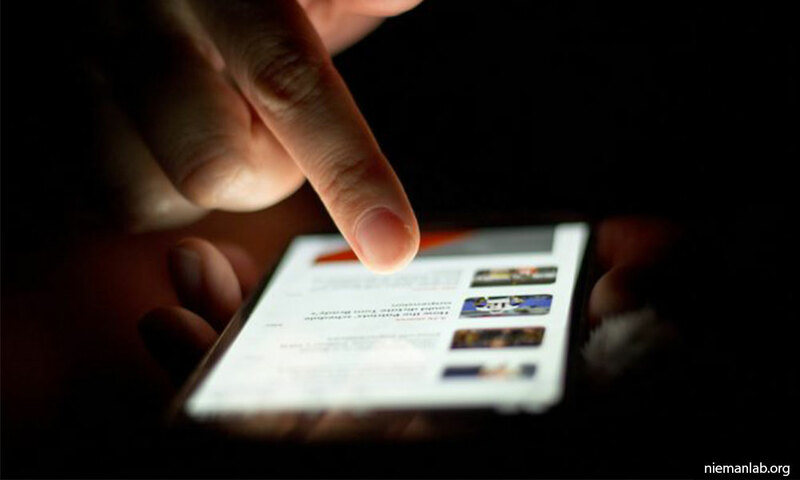 Further, a court order to remove the publication can be served “by electronic means,” which is not defined but could conceivably include service by email, Twitter, WhatsApp, or other forms of text messaging or social media. The likely procedure is for the Sessions Court to evaluate the complaint and any supporting evidence or documents submitted by the complainant and, if the court decides that the item is “fake news,” to grant an order. An order can be challenged, but an application to challenge does not operate to suspend or defer the original order, which must still be complied with. However, if it is the government that obtains the order, and it alleges that the “fake news” is prejudicial or likely to be prejudicial to public order or national security, and the court agrees, the order cannot be challenged. The proposed legislation does not deal with a situation if the government publishes “fake news.” Looking at what is taking place around the world, this is an omission that needs to be addressed. 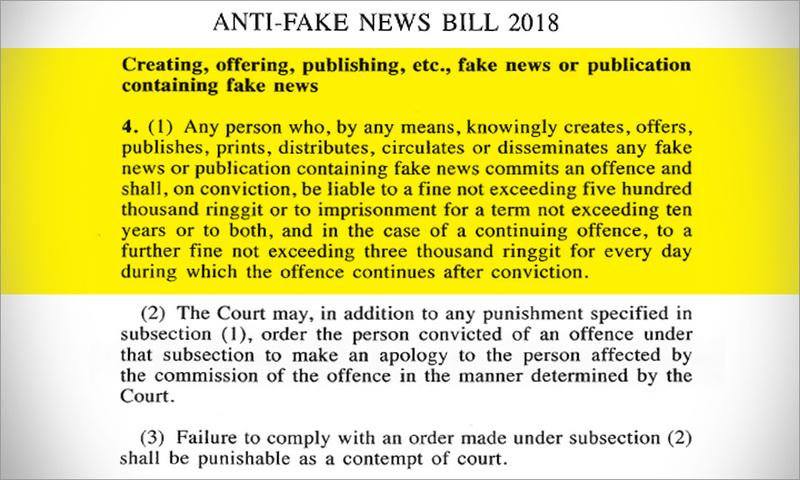 Thus, for example, if a news reporter writes a story about Malaysia that is held to contain “fake news,” the editor or subeditor of the company employing the news reporter would also be criminally liable. Failure to abide by a court order leads to the commission of a criminal offence, which carries a fine of up to RM100,000 and a continuing fine of RM3,000 for each day of non-compliance. Such failure also results in a contempt of court, and arrest is allowed under the Criminal Procedure Code. Why is new legislation necessary? The many illustrations, in the proposed legislation, of how an offence is committed under the proposed legislation actually involve the issue of civil or criminal defamation, for which Malaysia has adequate legislation and legal procedures. This again raises the question of why new legislation is required. Of serious concern is the fact that publishing a “caricature” can also constitute an offence of “fake news.” Parodies and poking fun, which by their very nature may involve some embellishment, would now constitute a criminal offence. What constitutes “knowing or having reasonable grounds to believe” is not defined. This lack of certainty gives cause for concern. The real issue of “fake news,” which is what is currently in the minds of many governments around the world, is about the setting up of fake social media accounts and publishing news through it, of sending tailored messages based on someone’s online profile, and the funding of the same, and influencing outcomes of elections. However, these matters are not adequately addressed in the proposed legislation. Only the issue of funding is dealt with and criminalised in the proposed section 5. 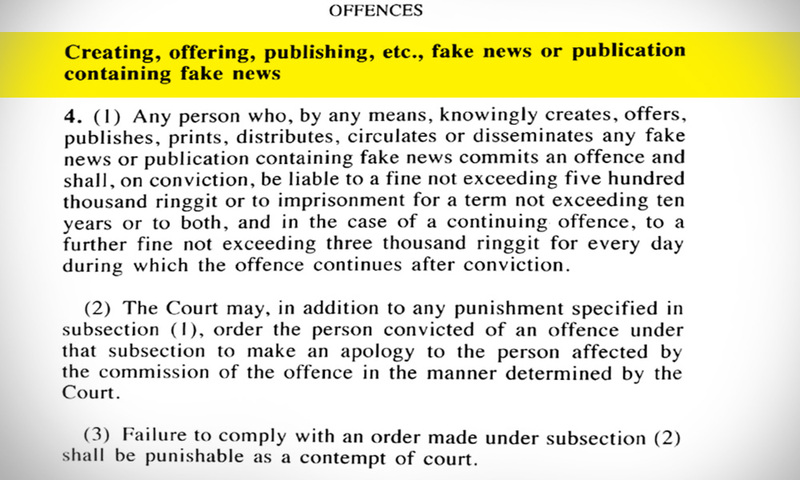 Again, other existing legislation already caters for the offence of aiding and abetting the spreading of false news, so this provision does not serve any purpose except for the provision of a huge maximum fine of RM500,000 and/or a heavy maximum jail sentence of 10 years, to act as a chilling deterrent. Previous issues of the prime minister receiving a vast donation prior to the last general election, and what may have been done with those funds, have been wholly overlooked. The presence in Malaysia of a foreign company involved in data analytics and online profiling is also ignored. If the Malaysian government were genuinely concerned about the possibility of foreign funding and foreign influence on the outcome of our upcoming general election, surely it should have focused instead on campaign finance reform, data security, and personal privacy. Ultimately, the public is left to ponder the “value add” of this proposed new legislation. Sensitivities about the reputation of Malaysia by way of negative comments and criticisms can now be attacked through an extremely wide extra-territorial application of the proposed legislation, putting this in the same category as international terrorism, cross-border corruption, money-laundering, and trafficking in persons. While this issue should not be ignored, the proposed broad-based law to criminalise the dissemination of news amounts to legislative overkill. The Malaysian Bar calls on the government to withdraw the proposed legislation from consideration at this current sitting of Parliament, and to convene a proper select committee to look comprehensively and publicly into the issue. The government must not legislate in haste. GEORGE VARUGHESE is president of the Malaysian Bar.